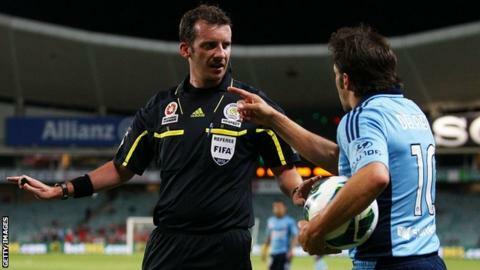 Referees in Australia's A-League will wear microphones for the end-of-season Finals Series. Television viewers will be able to hear referees in five matches, starting on Friday as Melbourne Victory host Sydney FC, and in the Grand Final. The audio will not be available live but will be used in programmes by the broadcasting company, Fox Sports. Referees in both rugby codes commonly wear microphones but the practice has yet to be widely adopted in football. The move will draw interest from broadcasters and leagues around the world as fans seek greater transparency on crucial decisions. Referees in the Premier League have microphones so they can communicate to their assistants but their conversations are not transmitted. In October 2012, former Football Association chief executive Mark Palios called for referees' remarks to be broadcast to fans after English official Mark Clattenburg was alleged to have used "inappropriate language" towards Chelsea's John Obi Mikel. Clattenburg was cleared of all wrongdoing. Football Federation Australia chief executive David Gallop said: "We believe the extra microphone is a significant step forward and gives fans a greater insight into what's happening on the pitch." The A-League Finals Series involves six teams - Brisbane Roar, Western Sydney Wanderers, Central Coast Mariners, Melbourne Victory, Sydney FC and Adelaide United. Former Juventus and Italian World Cup winner Alessandro Del Piero, 39, plays for Sydney FC.